Fresh Deals on Carpet Cleaning! And that’s not all—combine carpet cleaning with our furnace cleaning services, and you’ll get 15% off of your carpet cleaning! This discount applies only to regular carpet cleaning prices. 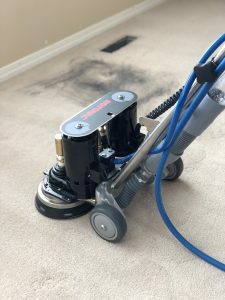 Ensuring the best carpet cleaning demands the best tools, and that’s why Fresh Air Furnace uses the powerful Rotovac DHX Powerhead extractors rather than traditional carpet cleaning wand attachments. Along with our two stage process that sees your carpet pre-treated and appropriately cleansed with eco-friendly cleaning agents, you’ll see stains removed fast and your carpets restored just like that! Keep your home free of dirt, bacteria, and dust with Fresh Air Furnace’s carpet cleaning services. Please note that an additional charge may apply to move furniture and other impediments to the cleaning, and that prices are subject to change based on the amount of rooms and room size. Looking for a quote or want to discuss having your furniture and mattresses cleaned as well? Contact the Fresh Air technicians at 403-452-9528 or at info@freshairfurnace.com to get started!